I don’t know about you, but anytime I’ve ever made pumpkin pie or had pumpkin pie it was from a can. 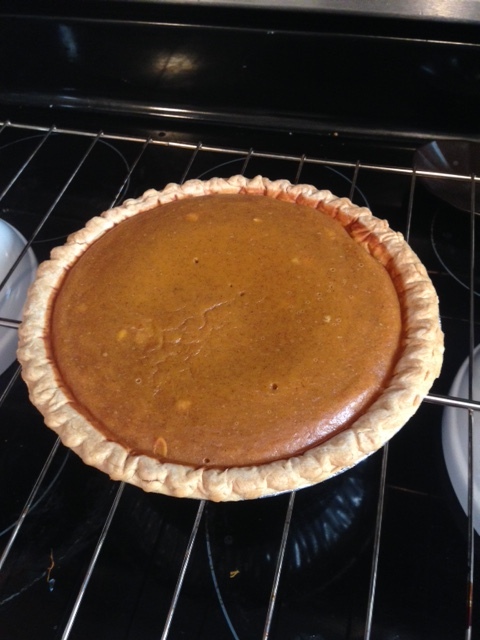 The thought of making a pumpkin pie from an actual pumpkin was, well, a bit daunting. Would it taste the same? Would it have that characteristic orangey color that we are so accustomed to? Would it have the same consistency? After a bit of internet research I found a recipe that didn’t seem too complicated and I tweaked it a bit. 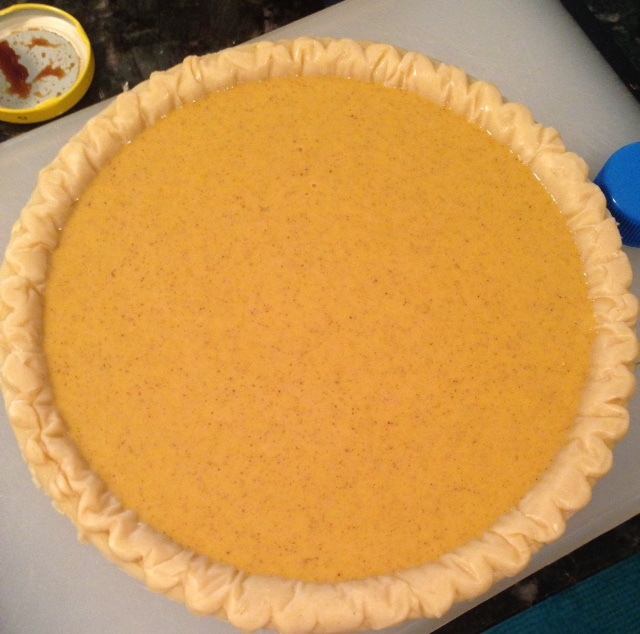 I received a sugar pie pumpkin in my organic co-op share and this is what spurred the entire from scratch pumpkin pie exploration. It was a cute little thing, weighing in at only 2 pounds! I will say I cheated a bit and used a frozen, store-bought crust because I’ve finally succumbed to the fact that baking is just not my forte. I’ll leave that to Fatgirl Hedonist–she’s got some decadent recipes for sweets on her blog! I must say that even though I’m a novice at baking, this was easy and it was delicious! Top it with some homemade whipped cream and you’ve got a great dessert for the holidays! Preheat your oven to 375 degrees to roast the pumpkin. 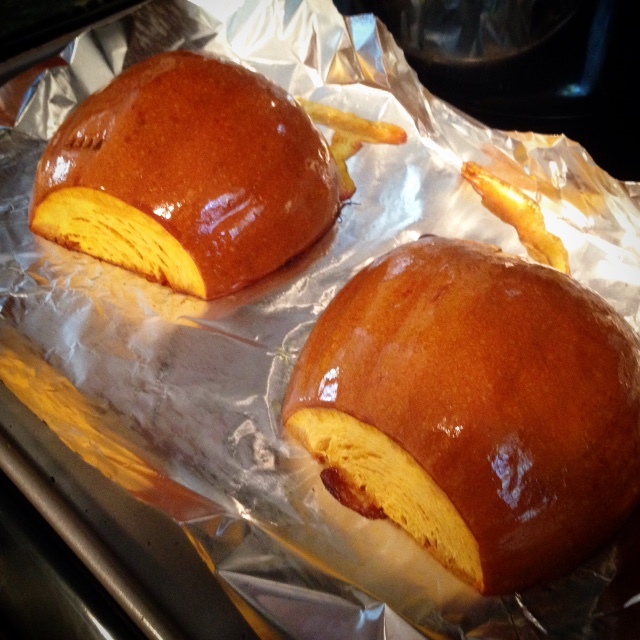 Place the pumpkin flesh side down on a aluminum foil lined baking sheet. Brush the outside with some canola oil so it doesn’t scorch or dry out. Bake for approximately 45-60 minutes, or until the flesh is tender. Once the pumpkin has cooked, and has cooled, scoop out the flesh and put into a food processor and puree until smooth–at this point you should have around 2 cups of pureed pumpkin. Reduce the oven to 350 degrees. In a large bowl combine all of the other ingredients and mix in the pumpkin puree until everything has been combined thoroughly. Mine was really liquid-y at this point and I was a bit worried, but it thickened up just fine!